Club member Tom Wood and his driver Zak Hughes got their 2018 MRF Fiesta ST Trophy campaign back on track by winning the 6th round of the Nicky Grist Stages. The crew took an all-out attack approach on the first stage (Llyn Login) to create a 6 second lead. The plan was then to manage the lead throughout the day but this wasn’t an easy task with the crews of James Giddings/Sion Cunniff and Kalvin Green/Osian Owen keeping them honest. A small mistake on the run through stage 3 (Halfway) cost the crew a handful of seconds but fortunately not the lead. The crew cleared stage 4 (Crychan) with a near perfect run only struggling slightly with dust hanging in the trees. It was back to service for a 45-minute halt then a repeat of the 4 morning stages. The second run through of the Llyn Login stage (formerly stage 1) saw the crew hit a chicane bale, luckily only causing cosmetic damage. In the final three stages, the crew had a small lead so they couldn’t let up – there was no choice but to attack. With the repeat passes of the stages the road conditions worsened putting the MRF tyres to the test. It was becoming a compromise between tyre management and not losing too much time. The crew finished the final stage (Crychan) to hear that their nearest rivals James Giddings/Sion Cunniff and Kalvin Green/Osian Owen had retired thus giving them a lead of nearly a minute. 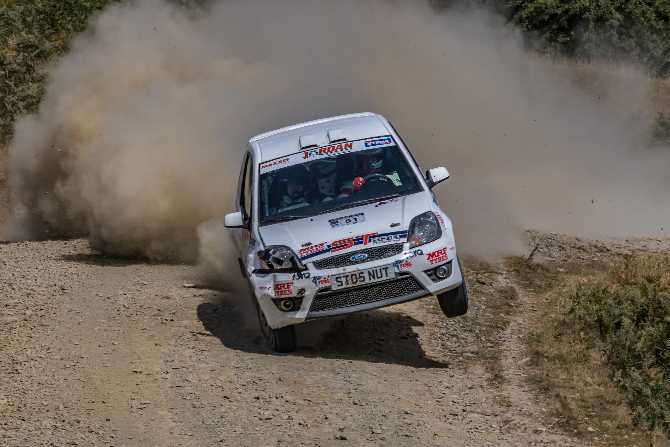 “Its an amazing feeling to get another win in the bag and some crucial championship points” said Wood This puts the championship back to being wide open, with the next round being on the Woodpecker Stages (Ludlow) on the 1st September.